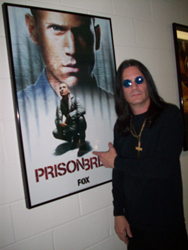 Don "Ozzy" is an actual Ozzy impersonator. He began playing in bands while in his teens and began doing Ozzy covers almost immediately. Band mates and fans discovered that Don had a gift; he looked and sounded just like Ozzy. Don took that gift and began studying Ozzy steadily and slowly began to incorporate Ozzy's persona into his stage shows. Though a mild mannered man off stage, Don recreates himself into the exact image of Ozzy when on stage; to see Don is to see Ozzy.